Today’s Object of the Day is on view in Tablescapes: Designs for Dining (October 5, 2018–April 14, 2019). These two candelabra in the neoclassical style, with their detailed sculptural work and multiple candle branches, would have undoubtedly brought abundant golden light as well as a sense of luxury to any early 19th-century interior. They were created in France between 1815 and 1825, by Pierre-Phillippe Thomire, the pre-eminent ornamental bronzier, or producer of gilt and patinated bronze, in France at that time. 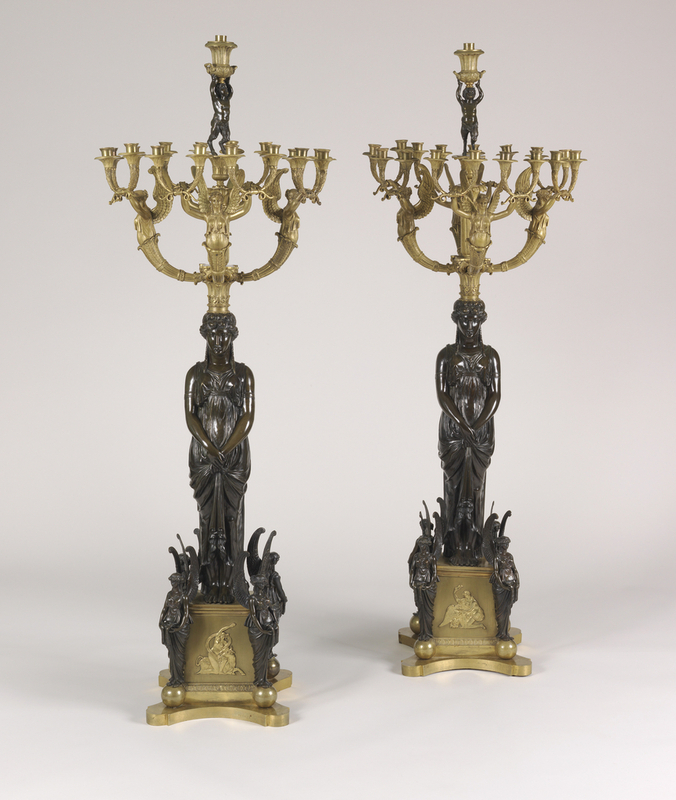 Each candelabrum features a standing female figure of patinated (darkened) bronze. Rising from the head of each are four gilt, winged females, each emerging from a cornucopia, in turn holding a double cornucopia in each of their hands, creating compound branches that serve as the support for sixteen candles. The branches are surmounted by a patinated putto-faun which is standing on a column and holding aloft an urn-shaped bobeche (candle socket). Each candelabrum rests solidly on its squared gilt bronze base adorned with a scene depicting the myth of Ganymede and the eagle. Thomire specialized in neoclassical and Empire style bronzes that served a variety of ornamental purposes. His early works included furniture mounts, escutcheons (the decorative gilt bronze surround protecting a keyhole), and the applied gilt bronze feet on beautifully crafted furniture or porcelain vases like those created by Sèvres. Thomire’s work set a high standard in his field, known in French as fondeur-ciseleur or founder-finisher. Thomire started his training before the French Revolution, in the workshop of Pierre Gouthière, producing works in the Louis XVI style. Working as a cisleur, his early duties were in production, adding texture and dimension to the metal forms through chasing. Mastering the skills of the guild, he opened his own shop in 1776. Thomire excelled in all aspects of gilt bronze production: modelling in wax, casting, matte gilding and mounting. These candelabra exemplify the quality of Thomire’s work, particularly in the details; the balance achieved in playing dark against light, the depth of the gilt metal’s shine, the textures created through chasing, and the overall appeal of the design itself. It would be helpful if C-H included the dimensions of the items illustrated. Thanks.